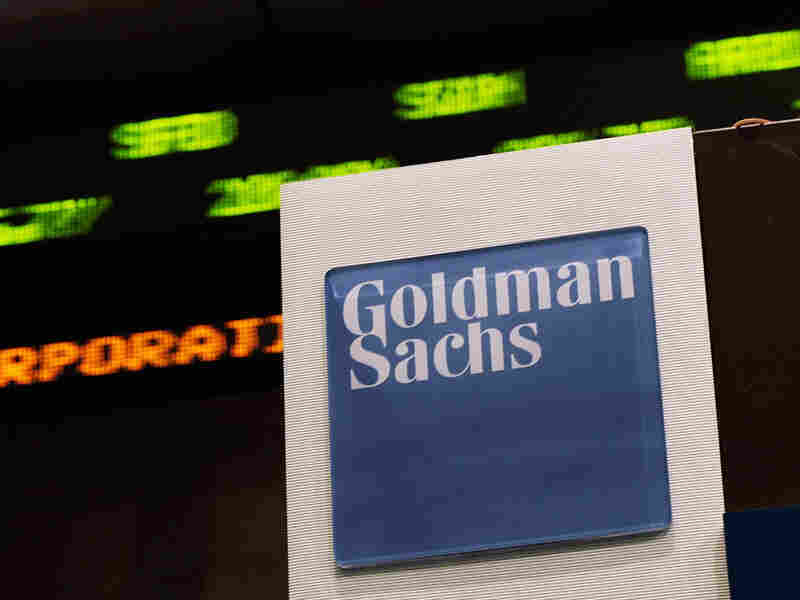 Goldman Sachs Starts To Fire Back At Exec Who Quit In Scathing Op-Ed : The Two-Way Greg Smith's scathing op-ed resignation letter is the talk of Wall Street. Now Goldman Sachs is trying to minimize the damage. And the Web is lighting up with chatter and parodies. With an essay in The New York Times that accuses Goldman Sachs of having a money-is-everything culture that is "toxic and destructive." "How did we get here?" writes Smith, who the Times identifies as having been an executive director at Goldman Sachs and head of the firm's United States equity derivatives business in Europe, the Middle East and Africa. "The firm changed the way it thought about leadership. Leadership used to be about ideas, setting an example and doing the right thing. Today, if you make enough money for the firm (and are not currently an ax murderer) you will be promoted into a position of influence." It is, as Jacob Goldstein puts it over at Planet Money, a "scathing op-ed." New York University journalism guru Jay Rosen calls it "absolutely devastating." "Greg Smith" is, not suprisingly, trending on Twitter. Now comes the inevitable blow back. "A person familiar with the matter," which probably means someone at Goldman Sachs or who was with the firm recently, tells The Wall Street Journal's Deal Journal blog that "Mr. Smith's role [was] actually vice president, a relatively junior position held by thousands of Goldman employees around the world. And Mr. Smith [was] the only employee in the derivatives business that he head[ed], this person said." The company also, as Jacob reported earlier, said Smith's views do not "reflect the way we run our business." Goldman Sachs does have to worry about what Smith wrote, of course, as Time magazine's Wall Street & Markets blog says. After all, the firm has been accused by members of Congress of being "a greedy, rapacious Wall Street predator that puts its own interests ahead of its clients," and now Smith's charges "will only fan the flames of popular anger at Goldman" and might set off "a client exodus." Smith also, for sure, has some questions to answer: Why quit now? He'd been with the firm 12 years; why did he stay? Update at 2:25 p.m. ET. Blankfein And Cohn Tell Employees It's "Unfortunate ... An Individual Opinion" Was Amplified. "In a company of our size, it is not shocking that some people could feel disgruntled. But that does not and should not represent our firm of more than 30,000 people. Everyone is entitled to his or her opinion. But, it is unfortunate that an individual opinion about Goldman Sachs is amplified in a newspaper and speaks louder than the regular, detailed and intensive feedback you have provided the firm and independent, public surveys of workplace environments." They also repeat that the things Smith asserted, "do not reflect our values, our culture and how the vast majority of people at Goldman Sachs think about the firm and the work it does on behalf of our clients."